I am the mother of a 14-year-old boy and 10-year-old girl. My kids are very active in all the sports and all other activities. They have been participating since they were small, and they always win most of the competitions. I am so proud of them. So, there are a lot of trophies lying at home. But, they are not kept properly. I want to display them all, and it should be seen in our hall. Now, we are doing some renovation works, so I thought of getting some shelf to display the trophies. I checked online for some simple ideas, and found this, <<link to commercial web site removed>>. Are these good ideas? How do you all manage to display the trophies? I've removed the link in your above post. We don't exist to provide advertising for commercial web sites. If you want to discuss interior decorating and design ideas, feel free. 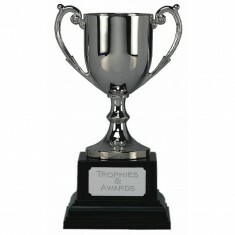 denise wrote: How do you all manage to display the trophies? I put the heads of my vanquished enemies on pikes outside the city gates. Pride is an irrational emotion at the best of times, even more so when it's in somebody else's deeds. eta: welcome to the forum denise! Let me explain to you why your pride is irrational. Say your boy won a trophy in a swimming competition. Why did he win? Was it his tenacious attitude? If so, neither you nor he can take credit for that, as it is the consequence of environmental and genetic influences beyond your control. Ah, you might say, but I am responsible for bringing him up that way! But you're not really responsible for how you raised him - you were only doing what you thought best at the time, and those decisions were formed in your brain according purely to environmental and genetic influences beyond your control. I'm not saying you can't love your kids - there's nothing irrational about love afaik, but pride looks cringeworthy and stupid to me. It's immodest for a further thing. I rent a large warehouse near Heathrow for all my trophies. Do you also keep a supply of loo role so you can...erm...relieve some of that self-loving pride fest? Keep it real, Keep It Real! That's rich, coming from somebody who claims they need a warehouse to store all their trophies in! Have I mentioned I won my secondary school chess championship and captained the school team when I was in the first year, aged just 11? Aren't I clever! I aim to be a trophy wife. Keep It Real wrote: That's rich, coming from somebody who claims they need a warehouse to store all their trophies in! I got your joke - I was joking too. I guess you should keep that trophy for yourself! Keep It Real wrote: I got your joke - I was joking too. I guess you should keep that trophy for yourself! That's OK, I wouldn't be able to shut the warehouse door. You can use my warehouse, it's empty. The size of the trophy is usually the inverse of the importance of the competition. It's not about the size, it's about what you do with it. At least that's what I heard. Is there a prize for guessing right?